‘Poetry,with its potential for combining head and heart, density of meaning with musicality, is for me the core form of human language’. Of his subject matter Ford says it was ‘liberating to be thinking as directly as possible about what matters most in life’. He admits his debt to, amongst others, a psychotherapist at Broadmoor and a priest and theologian whose enthusiasms were Thomas Traherne and the L’Arche communities for people with learning disabilities. No surprise then that the book’s Introduction is about ‘coping with being overwhelmed’. Those ‘overwhelmings’ both shape and distort our lives and he is keen to recognise and confront them. Whoever we are, we often ‘fail to cope, at least by the standards set by us or by our families or by others’. His way of coping is to ‘answer the big questions of life, death, purpose, good and evil’, and his main task ‘to stretch our minds, hearts and imaginations in trying to find and invent shapes of living’. Thus Chapter 1 is about people and how they shape our identity: Who are the faces and voices that concern us daily? Who are the people from the past and from the present who are always in our hearts even when we are not thinking of them? Before whom do we live? Who is welcome and who is shut out? Whom do we try to please? Whom do we fear? Chapter 2 is about desires; chapter 3 about virtue and character; chapter 4 about ‘secrets and disciplines’; and so on. When he asks in the Introduction what are the resources for answering his questions, the answer is the religions – to which 4 billion people around the world subscribe, sometimes (as he well knows and as befits something – ‘like families, the single biggest arena of conflict’ – which goes so deep) with violent consequences. And which religion? The religion of many in our society could be described as ‘a form of polytheism’, he says, with ‘many shifting objects of esteem and desire’. And since the great questions about life ‘do not allow for neutral statements’ -– ‘Everybody stands somewhere!’ he says -- Ford unapologetically uses his own religion (Christianity) to explain where he is coming from and to offer some shape to the discussion. At Wychwood Circle we have always been open to all views and all faiths (and none) – so we will trade on the fact that Ford’s discussion is also open to the less (or the not) ostensibly religious. (In chapter one, despite his introductory warning, there is no reference to God until page 19!) And at Wychwood Circle we would no more dismiss the Bible than we would reject Shakespeare, or for that matter Michael O’Siadhail’s poetry. 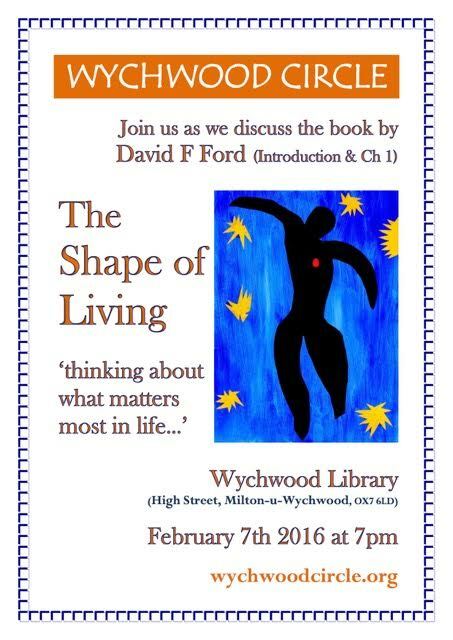 The Shape of Living (Introduction and Chapter 1) will be our theme for the first meeting of 2016, beginning at 7pm on February 7th at Wychwood Library and ending no later than 9pm. The question, How are our lives shaped, seems a good starting point for 2016 and we will decide after this initial discussion whether we want to return to all or any of the remaining chapters later in the year.